The ACHD Director oversees the day-to-day operation and management of the ACHD workforce. Bruce S. Wong, a retired U.S. Air Force Colonel, became Director on February 7, 2011. During his tenure, ACHD adopted an Integrated Five-Year Work Plan to provide more transparency and to display the link between the District’s capital construction program and daily operations and maintenance activities. The District also added flashing yellow arrows at intersections to improve traffic flow, placed reflective pavement markers to enhance nighttime driving, introduced green turn boxes and painted lanes to increase cyclist safety, expand bicycle and pedestrian travel lanes, increased community program funding and focused maintenance and traffic operation strategies. A five-member Commission governs the ACHD. For 2019, the Commission members are: Rebecca W. Arnold (President), Sara M. Baker (2nd Vice President), Kent Goldthorpe, Jim D. Hansen and Mary May (1st Vice President). The term of office for each Commissioner is based on a rotation schedule designated by state law. The Commission generally meets on the first, second, and third Wednesday of the month at noon. An evening meeting occurs on the fourth Wednesday of the month at 6 p.m. and every effort is made to schedule items of potential public interest for the evening meetings. No meetings occur on the fifth Wednesday of any month. Special meetings are scheduled as needed. The Lake Hazel Extension/Gowen Road Relocation study is a project led by the Ada County Highway District (ACHD) in partnership with Boise City and the Boise Airport. The study was adopted by the ACHD Commission on December 22, 2008. This project will make it possible for ACHD to preserve the new route for the Lake Hazel Extension and connecting roads as developement occurs in the area. Input from the public and several agencies that are involved with this project will be used in the decision-making process. Boise City and the Boise Airport are key partners and will be involved in developing the study outcomes. 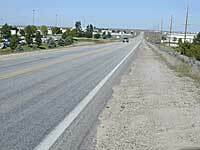 ACHD plans to formally adopt this study and anticipates Boise City will do the same. A route that will extend Lake Hazel Road east and connect it to Eisenman Road and the Isaac's Canyon Interchange at Interstate 84. Options for possibly closing the existing Gowen Road and relocating it to the south, allowing for Boise Airport expansion. Up to eight miles of new roadway for the Lake Hazel extension route as well as an additional four miles of new or realigned roadway between the Lake Hazel Extension, Gowen Road and Orchard Street. Bridges where the new alignment crosses the New York Canal and the railroad. The new road has been identified by Community Planning Association of Southwest Idaho (COMPASS) and the ongoing Communities in Motion long-range transportation study as an important link in the valley's transportation system. The Ada County Highway District (ACHD) is pleased to share the latest information on the Lake Hazel/Gowen Road Relocation Study. Input from the public open house has been incorporated into the study and ACHD expanded several parts of the study based on new information about development in the area. In April, 2006 ACHD held an open house giving the public an opportunity to learn about the study and provide input on the possible routes and roadway design features. The majority of respondents agree that Lake Hazel Road should be extended. Lake Hazel residents want a 3-lane road with a 35 mph speed limit (or lower), but others want a 5-lane road. Moonridge Subdivision residents are concerned about adding traffic to Lake Hazel Road. Make the Orchard Avenue and Production Road connections as straight and direct as possible. There is support for an Eisenman Road extension and connection with the Isaac's Canyon Interchange. Bicycle and pedestrian paths should be included in the corridor. An environmental scan of the area revealed no major archaeological, historical or hazardous material obstacles. A thorough review of the public comments collected from the April, 2006 open house has been completed and the alignments were revised to reflect the comments. ACHD is updating the project area traffic model to reflect recently proposed major developments and planned communities south of town. A new â€¦"collector road" study was started to develop a more complete secondary road network as the area develops. Collector roads are designed to move traffic from local roads to major arterials. The access management study was expanded to determine the best location for intersections, medians and traffic signals. The additional work is targeted to be completed this year. ACHD will host a second open house in Spring/Summer of 2007 where there will be an opportunity to view and provide comments on the recommended alignment roadway network and the access management study outcomes. The Lake Hazel Extension/Gowen Road Relocation study is a project led by the Ada County Highway District (ACHD) in partnership with Boise City and the Boise Airport. Up to eight miles of new roadway for the Lake Hazel extension route as well as an additional four miles of new or realigned roadway between the Lake Hazel Extension, Gowen Road and Orchard Street . This project will make it possible for ACHD to preserve the new route for the Lake Hazel Extension and connecting roads as development occurs in the area. Input from the public and several agencies that are involved with this project will be used in the decision-making process. Boise City and the Boise Airport are key partners and will be involved in developing the study outcomes. ACHD plans to formally adopt this study and anticipates Boise City will do the same. The study will be completed by fall 2006. Construction will be scheduled in the future as the area develops.